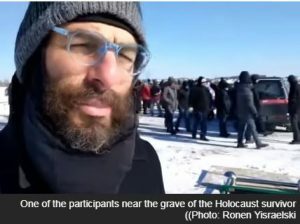 Earlier this week, a beautiful story telling how 200 Yidden in Toronto gathered in the frigid cold to attend the levayeh of an 85-year-old Holocaust survivor whom they had never met swept the news media around the world, effecting a tremendous kiddush Hashem. Hamodia was privileged to hold an exclusive interview with Rabbi Zale Newman, the Toronto Rabbi involved in the story, to obtain many additional (and corrected) details that were not part of the original story. The story of Eddie Ford, Efraim ben Dov z’l, and his levayeh really begins about two years ago, when Mr. Ford, or Reb Efraim as he was often called, was hospitalized with cancer in Sunny Brook Hospital, a large medical complex within walking distance of Toronto’s frum community. Bikur Cholim of Toronto, an organization with approximately 500 volunteers that provides many diverse services to the cholim of Toronto and their families, began sending volunteers to visit Reb Efraim in Sunny Brook. A few months ago, Rabbi Zale Newman, a volunteer for Bikur Cholim who usually visits patients on Erev Shabbos, began to visit him as well. Reb Efraim barely remembered his Jewish life in Budapest but continued to maintain a few traditions. Eventually he married, but was then divorced. He never had any children, but he did take care of his mother devotedly at the end of her life. Rabbi Newman laughed and replied, “Kosher food has nothing to do with a kosher funeral! Do you want a proper Jewish funeral in a Jewish cemetery?” “Of course!” he responded. Rebbetzin Chana Hirschman, director of Outreach for Bikur Cholim of Toronto, sprang into action and began making the arrangements for a Jewish funeral, including contacting a nephew of Reb Efraim’s who lives in Detroit. During the following weeks, Reb Efraim began wearing a yarmulke, putting on tefillin, and even started learning about brachos. About two weeks ago his situation took a turn for the worse, and Reb Efraim began to lose consciousness. On Tuesday, January 29, Bikur Cholim was notified that he has passed away. Mrs. Hirschman worked tirelessly for 24 hours to get the rights to bury the body and make the last-minute funeral arrangements, which the funeral home agreed to do free of charge, as Reb Efraim had had very little assets. Finally, the levayeh was set for noon on Thursday. However, Thursday was scheduled to be one of the coldest days in Toronto history, due to the polar vortex, with a high temperature of minus 27 degrees and very strong winds. Furthermore, there were already three feet of snow on the ground, and the funeral was slated to take place at a newer cemetery, about an hour’s drive from the Toronto community. Rabbi Newman had agreed to officiate at the levayeh but was worried that he would be the only one there. Late Wednesday night, Rabbi Newman sent out messages via email and social media stating that he needed a minyan for a levayeh for a Holocaust survivor. When he arrived at the cemetery the next morning, he was shocked to find that there were so many cars that he couldn’t enter the cemetery. At first he thought there was another funeral, but by the time he managed to reach the kever, he found over 200 people who had come in the freezing weather to give kovod acharon to Reb Efraim! “I could not see who was there, as everyone’s faces were covered with scarves due to the extreme temperature. I saw beards, I saw young and old, I saw frum and non-frum, and all helped to fill the kever with the frozen dirt.” Rabbi Newman even said a hesped for Reb Efraim, describing his sweetness and hisorerus in teshvuah during the last few months of his life. The entire ceremony lasted about 45 minutes, while all endured the freezing cold. As a postscript, about $1,000 was found in Reb Efraim’s savings account after his death. Bikur Cholim offered the money to Reb Efraim’s Philipino caregiver, who had not been paid in months, while continuing to provide dedicated care. However, she refused to accept the money and said that it should be used to pay someone to say Kaddish! Kollel Avreichim of Toronto has appointed someone to say Kaddish on behalf of Efraim ben Dov, zichrono livrachah.